or Destroy him... URANIUM 235 and plutonium are now man's slaves. They will build or destroy as he orders. Man dreads this vast force only because he distrusts himself. War is proof that man in the mass has never achieved self-control. He has always sought better weapons; yet the perfect weapon now brings him no satisfaction for he sees in the atom bomb his own destruction as well as that of his enemy. The ultimate benefits of nuclear energy may well surpass its present terrors, but the terrors are here now in awful dimension, and man must face them. He must pay this price for unlocking the wealth of the inner atom. 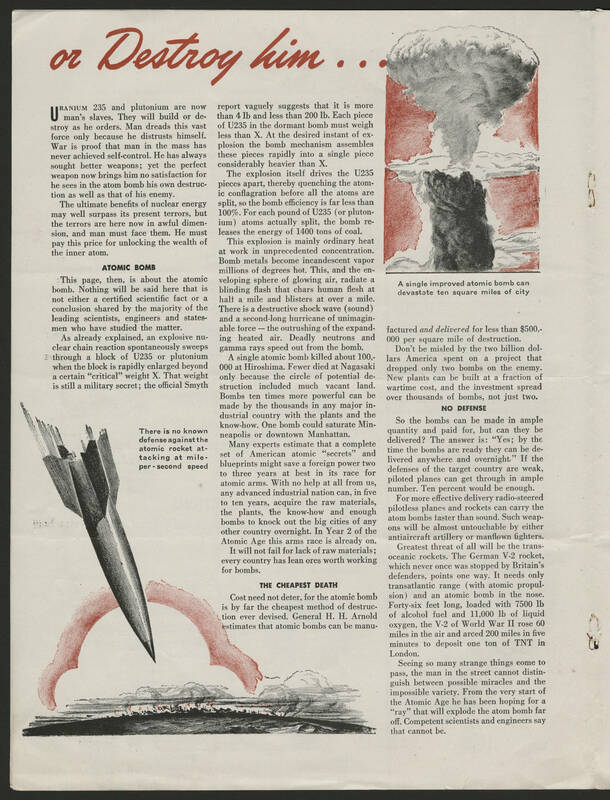 ATOMIC BOMB This page, then, is about the atomic bomb. Nothing will be said here that is not either a certified scientific fact or a conclusion shared by the majority of the leading scientists, engineers and statesmen who have studied the matter. As already explained, an explosive nuclear chain reaction spontaneously sweeps through a block of U235 or plutonium when the block is rapidly enlarged beyond a certain "critical" weight X. That weight is still a military secret; the official Smyth report vaguely suggests that it is more than 4 lb and less that 200 lb. Each piece of U235 in the dormant bomb must weigh less than X. At the desired instant of explosion the bomb mechanism assembles these pieces rapidly into a single piece considerably heavier than X. The explosion itself drives the U235 pieces apart, thereby quenching the atomic conflagration before all the atoms are split, so the bomb efficiency is far less than 100%. For each pound of U235 (or plutonium) atoms actually split, the bomb releases the energy of 1400 tons of coal. This explsion is mainly ordinary heat at work in unprecedented concentration. Bomb metals become incandescent vapor millions of degrees hot. This, and the enveloping sphere of glowing air, radiate a blinding flash that chars human flesh at half a mile and blisters at over a mile. There is a destructive shock wave (sound) and a second-long hurricane of unimaginable force - the outrushing of the expanding heated air. Deadly neutrons and gamma rays speed out from the bomb. A single atomic bomb killed about 100,000 at Hiroshima. Fewer died at Nagasaki only because the circle of potential destruction included much vacant land. Bombs ten times more powerful can be made by the thousands in any major industrial country with the plants and the know-how. One bomb could saturate Minneapolis or downtown Manhattan. Many experts estimate that a complete set of American atomic "secrets" and blueprints might save a foreign power two to three years at best inits race for atomic arms. With no help at all from us, any advanced industrial nation can, in five to ten years, acquire the raw materials, the plants, the know-how and enough bombs to knock out the big cities of any other country overnight. In Year 2 of the Atomic Age this arms race is already on. It will not fail for lack of raw materials; every country has lean ores worth working for bombs. THE CHEAPEST DEATH Cost need not deter, for the atomic bomb is by far the cheapest method of destruction ever devised. General H. H. Arnold estimates that atomic bombs can be manufactured [[italics]]and delivered[[end italics]] for less than $500,000 per square mile of destruction. Don't be misled by the two billion dollars America spent on a project that dropped only two bombs on the enemy. New plants can be built at a fraction of wartime cost, and the investment spread over thousands of bombs, not just two. NO DEFENSE So the bombs can be made in ample quantity and paid for, but can they be delivered? The answer is: "Yes; by the time the bombs are ready they can be delivered anywhere and overnight." If the defenses of the target country are weak, piloted planes can get through in ample number. Ten percent would be enough. For more effective delivery radio-steered pilotless planes and rockets can carry the atom bombs taster than sound. Such weapons will be almost untouchable by either antiaircraft artillery or manflown fighters. Greatest threat of all will be the transoceanic rockets. The German V-2 rocket, which never once was topped by Britain's defenders, points one way. It needs only transatlantic range (with atomic propulsion) and an atomic bomb in the nose. Forty-six feet long, loaded with 7500 lb of alcohol fuel and 11,000 lb of liquid oxygen, the V-2 of World War II rose 60 miles in the air and arced 200 miles in five minutes to deposit one ton of TNT in London. Seeing so many strange things come to pass, the man in the street cannot distinguish between possible miracles and the impossible variety. From the very start of the Atomic Age he has been hoping for a "ray" that will explode the atom bomb far off. Competent scientists and engineers say that cannot be.